Some actors have to wait a while between major TV roles. Whether they don't get offered the right part, or just have to sprinkle guest appearances here and there, it normally takes a year or so before you see your favorite stars join another series. 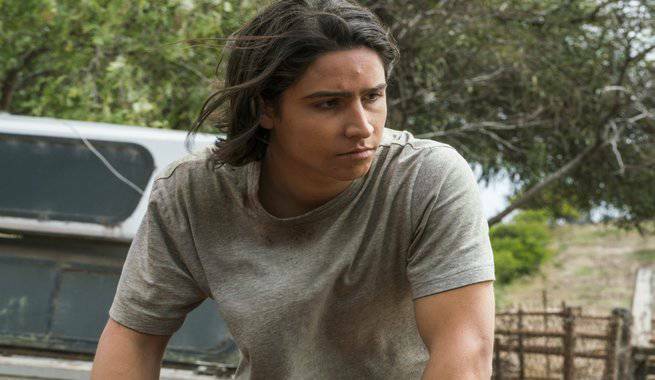 This wasn't the case for Fear The Walking Dead star Lorenzo James Henrie. As the second season of Fear was ending, it was revealed that Henrie had signed on to play Gabe Reyes on Marvel's Agents Of SHIELD. The character is the brother of Ghost Rider, and is set to play a major part in the show's fourth season. Lorenzo's character on Fear The Walking Dead, Chris, was killed in the season finale in September. It was only a matter of weeks before he made his debut on SHIELD. ComicBook.com's Walking Dead Insider Brandon Davis had the chance to catch up with Lorenzo, and talk about the two roles. Brandon first asked Henrie about his death on Fear The Walking Dead, and what it was like to film that brutal scene. "That was my last scene in the series. It was a fun day," says Lorenzo. "It was tough 'cause I barely had a lot of pads on so I was actually getting cut up on the street. But it worked, cause I was using all that emotion." Chris had a difficult death on the show, and many didn't want to see him go. The scene did act as a motivation for his father, however, and Travis was changed after it all went down. "Thats the beauty of story. Sometimes you have to lose the person you love most in order to propel that character." Being a part of The Walking Dead Universe, Brandon had to know how Henrie felt about the season seven premiere episode. The actor immediately related to Steven Yeun, and how weird it must be to say goodbye after that long. "It’s weird cause they’re such iconic character, especially Steven" Henrie said. "He had seven seasons under his belt. Some people don’t even get two seasons….pretty epic deaths on that show." When making the jump over to Agents Of SHIELD, Lorenzo said he only needed a couple of auditions to get there. He said it was one of his first auditions after he stopped filming Fear. During the audition, the casting team wasn't even sure if Lorenzo was still on Fear or not. The episode featuring his death hadn't been released yet, and no one wanted to make a rash decision. The actor had to give them a somewhat cryptic answer. "Without giving us any spoilers can you do this role? I started to smile, and I was like 'Yeah.' I auditioned for it, and literally the next day I got it." Lorenzo James Henrie has excelled on both shows he has been a part of this year, and we're looking forward to seeing more of him as Agents Of SHIELD gets deeper into the season.